This is the second blog post of the series on Amazon EBS snapshots vs. Amazon EC2 instance backup with NAKIVO Backup & Replication (in the first blog post, we explained what AWS snapshot is and described its major limitations). In this post, we will describe NAKIVO Backup & Replication’s features and methods related to the creation and maintenance of AWS EC2 instance backups and lead you through the whole EC2 backup procedure. 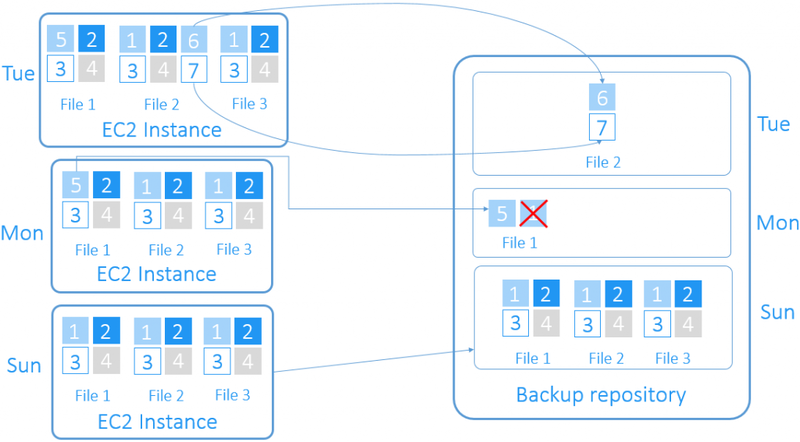 How Does NAKIVO Backup & Replication Perform EC2 Instance Backup? NAKIVO Backup & Replication is a modern VM backup solution with many useful data protection features. To learn more, you can download this Free White Paper outlining 21 advantages of modern native backup solutions (like NAKIVO Backup & Replication) over legacy backup software. Using NAKIVO Backup & Replication, you can protect your AWS EC2 instances from any kind of disaster or failure and optimize your data protection lifecycle. The following are some of the product’s features designed to streamline the EC2 backup process. With classic incremental backup systems, you need to perform a full backup from time to time. To save you time and backup repository space, NAKIVO Backup & Replication applies the “forever-incremental” backup approach. In the forever-incremental EC2 backup, one initial full backup of your AWS EC2 instance is created. With every increment thereafter, only changes made in the EC2 instance since the last job run are stored in your backup repository. This simple diagram illustrates how the technology works. Being able to perform application-aware backup is critical for ensuring the transactional consistency of applications and databases (like Microsoft Exchange, MS SQL, or Active Directory) running inside AWS EC2 instances. NAKIVO Backup & Replication provides you with an application-aware backup mode for Windows-based and Linux-based AWS EC2 instances. All you need is the proper credentials for the OS installed in the EC2 instance. With NAKIVO Backup & Replication, you can instantly recover individual files or MS Exchange, SQL, or Active Directory objects directly from the deduplicated and compressed EC2 instance backups. There is no need to recover a full AWS EC2 instance first. To avoid overlapping backup jobs and overloading critical parts of infrastructure, NAKIVO Backup & Replication offers a built-in Calendar Dashboard and configurable retention policy. You can use these features for both Amazon EC2 instance backups and on-site VM backups. Skipping of swap data: NAKIVO Backup & Replication automatically skips swap files and partitions in AWS EC2 instances, so your EC2 backups are smaller and, therefore, occupy less storage space. Built-in global data deduplication: The product automatically deduplicates all blocks of data in EC2 backups across an entire backup repository, so only unique data blocks are stored. Data compression: The deduplicated blocks of data are further compressed, shrinking the storage space your EC2 backup takes up. This simple diagram illustrates how the backed-up EC2 instance data is reduced if all of the abovementioned features are used. 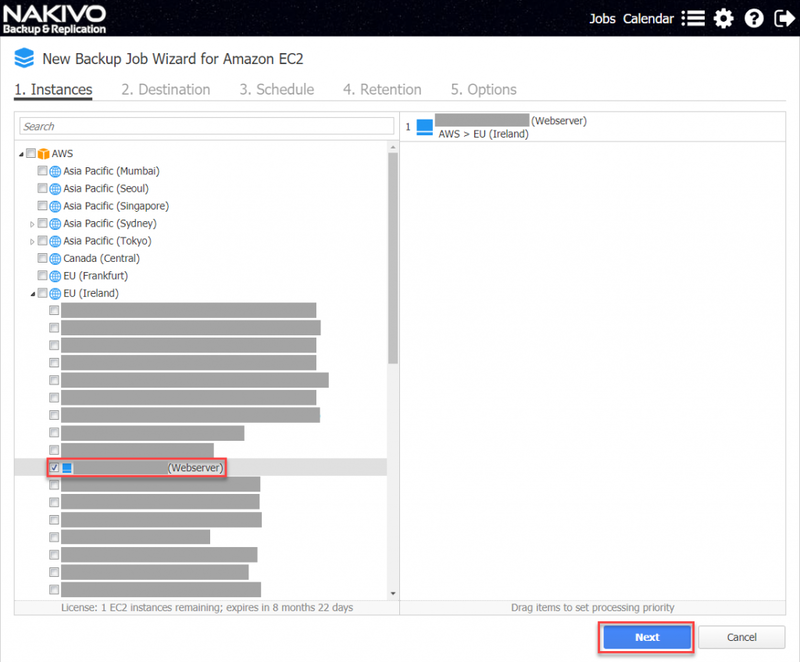 One of the greatest advantages of using NAKIVO Backup & Replication to protect your Amazon EC2 instances is that you can easily create and maintain copies of your EC2 backups and choose from several backup repository options for where to store them. This could include on-site, off-site, or in another supported cloud. Download the Free Edition of NAKIVO Backup & Replication – absolutely free, forever! Create and run an Amazon EC2 backup job. From the panel on the left, click Users. Click your IAM username (the name itself, not the checkbox to the left of it). Click Download Credentials and store your keys in a secure location. 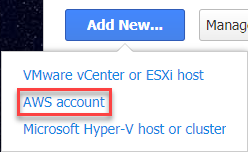 Secret access key: Enter the secret access key for your AWS account. Go to the Transporters tab, then click Add Transporter. Select Deploy new transporter (AWS EC2). Instance type: Select the type of Amazon EC2 instance to which the transporter will be deployed (in our case, it is “t2.medium”). NOTE: Some EC2 instance types may be able to process data faster, but using them may increase your spending. Wait for the deployment process to complete. Go to the Jobs dashboard. Select Amazon EC2 backup job. This will open the New Backup Job Wizard for Amazon EC2. At the first step – Instances – select the EC2 instance that you want to back up. Click Next. At the second step of the Wizard – Destination – select your backup repository. This will be the target location for your EC2 instance backup. At the third step of the Wizard – Schedule – set up your backup job schedule. In our example, backups will be performed each weekday at 12:00 AM. Click Next. 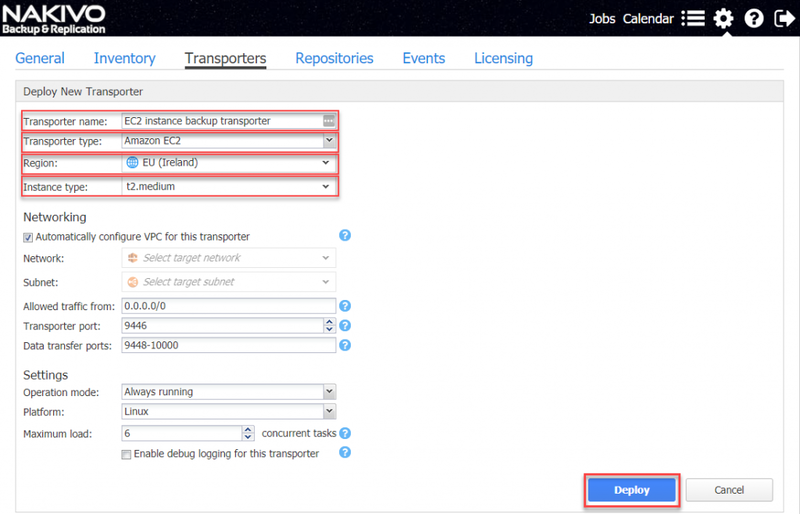 At the fourth step – Retention – configure the retention policy for your EC2 backup jobs. Click Next. Temporary volumes: Select a temporary Amazon volume for while your EC2 backup is created. To minimize costs, select the default “Magnetic” volume. Click Finish or Finish & Run to start the backup process. NAKIVO Backup & Replication allows you to create on-site backups of your Amazon EC2 instance(s) with retention policy planning, deduplication, encryption, and other useful features to cut costs and keep your data safe. When using the software, you get all benefits offered by AWS EC2 instances as well as reliable, easy-to-maintain EC2 backups, so you can rest assured you’re prepared for any kind of disaster. In our next article, we will compare the two methods – Amazon EBS snapshots and Amazon EC2 instance backup with NAKIVO Backup & Replication. So, stay tuned for Blog updates! Meanwhile, you can test NAKIVO Backup & Replication and create backups of your own EC2 instances: download the product’s full-featured Free Trial or request a free Live Demonstration.